My husband wrote about some of the thinking that went into our lunch planning with the kids. I figured I should write a follow-up blog about what our results were and some of the specific hacks we have used. I hope you will also share the ideas you come up with. I created a Pinterest Board so I could save all the ideas that I have found on the internet. I am a visual person and there are so many great ideas. We went through the board with our kids and created our own list. We also set up time on Friday afternoons or Sundays to prepare as many snacks as possible for both Shabbat and the week. It may just mean taking down the box of pretzels from above the washing machine and dryer or it might mean packing individual bags for the week. We have the kids put together enough of the snacks that they want to eat during the week, so when they are prepping their lunches they can just pull the kinds of food they want. We use EasyLunchboxes for the containers. It easily divides their container into three different areas and then they put their snacks for the morning and the afternoon on top of the container in their lunchbox. I think we will need to invest in at least one thermos for some of the new ideas that they have come up with. Our older kids go to a school that is not nut-free. I have to say that this is amazing. I love the approach they have taken to having individual classrooms that school are nut free/sesame free. The lunch room, however, is not nut free. And its a real game-changer for my 3rd grader who eats in the lunchroom. She is able to take carrots & hummus, a peanut butter sandwich, etc. It just adds to the variety of options she has. It also teaches her a lesson to be respectful of her peers and make sure her snacks or birthday treats follow the limitations of the rest of the kids in her classroom. Please share the ideas you come up with. While I was transferring files last night, I noticed that I was nearing the end on of my room on the external card on my phone. Since cleaning off my card has been on my long to do list for a while, I figured it was about time to actually remove files. Some of the files are left over my three phones ago and are related to apps that wouldn’t run on my current phone. I used my extra card for apps because the phones had no room on them. I also realized how many files that I had viewed at some point were still on my phone and left lots of orphans. I need to go through the downloads on all of our computers also. I am still unpacking from our Passover Vacation away. For the most part we got almost everything unpacked and in the laundry room rather quickly. But I left my suitcase until the end to try to keep the clutter to the mess. While we were traveling we did a side trip to the outlets in Maryland and I was able to find a bunch of really great deals at the outlets for pieces to just expand my options with outfits. I work at a more corporate building and when I started working I was pregnant, so this is the first time I am not pregnant or breast feeding, so my wardrobe was definitely in a need of a little updating. Most of the time I keep my closet separated into sections. My dresses and long skirts in one area, my suits in another, my skirts in another, my summer weight shirts in another, my sweaters in another, and then all my jackets and cardigans. Over the last month as I was hoping for warmer weather, I started keeping everything I had worn in one section of my closet. I was hoping to try not to wear anything from that side of the closet until I had tried to use more of my wardrobe. The other reason was so I could figure out what was just sitting in my closet and no longer being worn. 3. Do I have something to match it? I made pies of clothing to go away into my drawers that are no longer filled with Maternity/Nursing clothing. And then piles to try to sell or donate. There are a ton of places to sell clothing to, but the issue with most of them is that they only want items from the last year or so to try to sell. I can understand they want to stay with the trends and styles. We have a lot of great resources in our Jewish community to donate clothing. This is usually my first choice if I have the time. We even have a Jewish Freebay group on Facebook that I can post everything I have and give it to other people in the community. There are also so many resources of places that will come and pick up. In other communities we have lived in that were not so fortunate to have a Jewish Freebay, we have donated to Habitat for Humanity’s ReStore, Big Brothers & Big Sisters, NCJW, etc. I wear a lot of different scarfs in my hair, so I found this great hanger and they take up a lot less room. I wear a tank top under a lot of my clothing, so I found these great to hold tank tops and camisoles. It works much better than trying to get them to stay on regular hangers or being lost in a drawer. For my husband, we bought these in the fall and they have been great. We inherited them from our first house because the previous owner made one of the bedrooms into a walk-closet and so there were lots of storage items and organizational items that were left over. 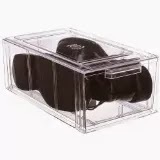 My favorite thing were these crystal clear shoe box size stackable drawers. I think I have seen them at the Container Store before. 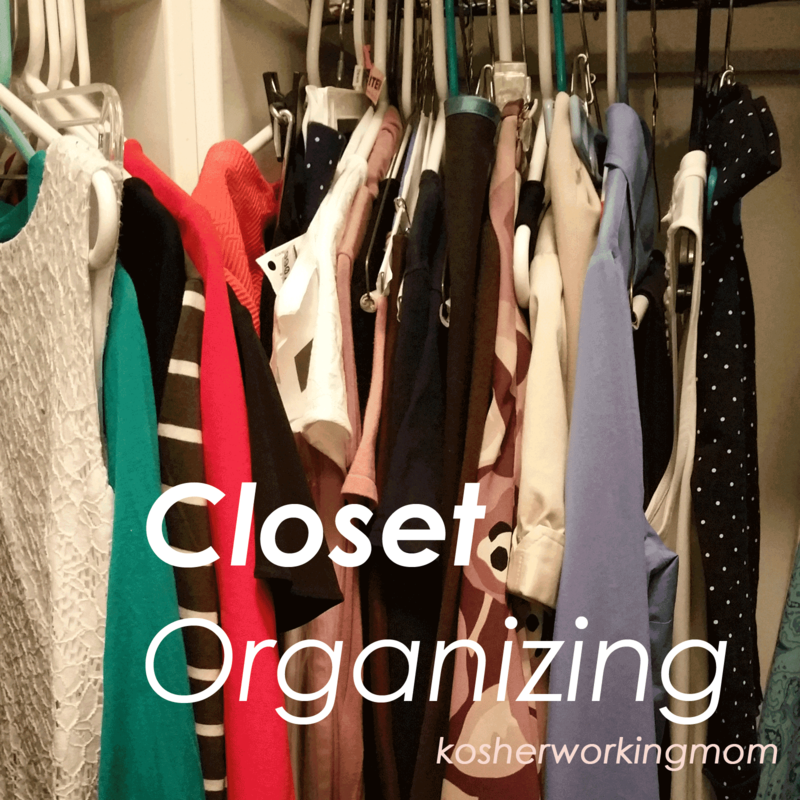 Do you need some inspiration for closet organization? I’ve been reading a lot of blogs lately about pairing down wardrobes, but one of the ones I find most intriguing is Project 333. I’m not sure I can pair down to only 33 items. Could you? 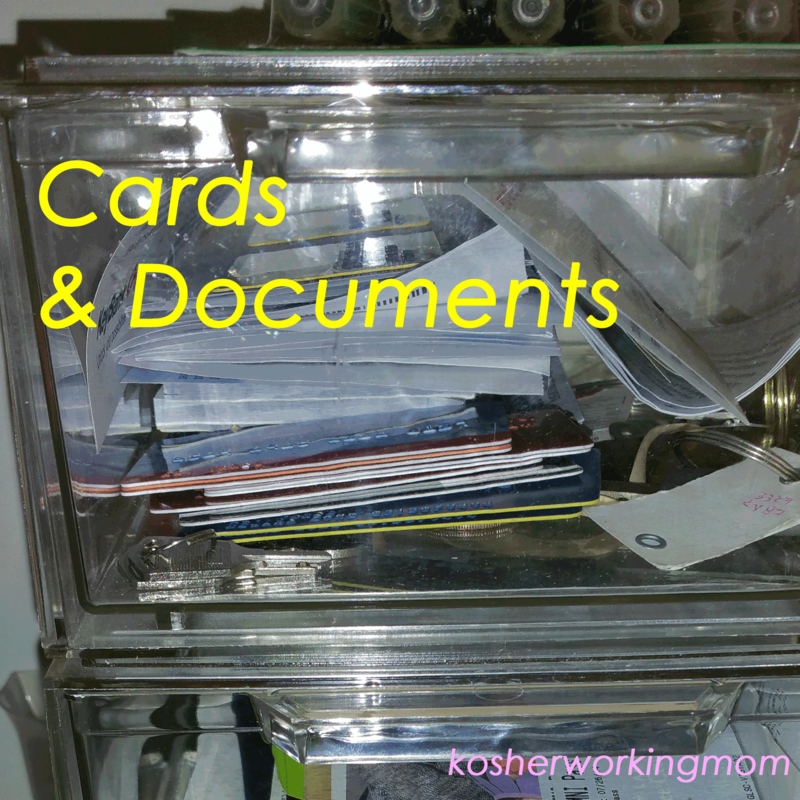 Today I am sharing something I started a couple months ago, that has helped organize us and keep up on at all the laundry that piles up with three kids. When the kids were in swim lessons, I also added bathing suits to be washed to the mix. It will definitely go back on the list at least one time a week this summer if not more. When Shabbat ended earlier, I would get a head start on the week and run laundry, but now by the time Shabbat ends, it is too late to get anything done. If I do this, I just mark off the laundry I finished and work on the next set of laundry that has enough to merit a load of laundry. I use this more a guideline. It also helps me keep enough time between non-dryer runs, to let the clothing actually dry. The links in the post may be affiliate links. Read the full disclosure. While we have put many of our “store cards” in Google Wallet, we have a most of them in a bin. I need to add to the todo list to register some of the cards, but that is a task for another day. I also got rid of bunch of cards that were no longer valid or that we had multiple copies of. I didn’t realize how many credit cards I had multiple copies of because I had credit cards that had expired several years ago still around. Or several copies of the same credit card. I organized the copies of our important documents and other documents so they would be together. The one item that I did not get rid of was Health cards. We have so many old Health Cards, but I am hesitant to give them up. Partly because I feel like because billing sometimes takes so long, that I just got a bill in December for something that had happened in June on my previous Health Provider. Stay tuned on this channel for deals! Shabbat Candle Lighting times for Potomac, MD 20854 courtesy of hebcal.com. Visit Ali Yares's profile on Pinterest. On this blog we will share deals we find, recipes we like, and anything else that seems interesting.